LAID - Legally Armed In Detroit (Michigan CPL CCW Classes): Should All House-Hold Firearms Be Unloaded and Locked Up To Protect Children? Should All House-Hold Firearms Be Unloaded and Locked Up To Protect Children? Along with everyone else in the metro-Detroit area, I was saddened to see on the news telecast last week that a four year old child had retrieved a loaded rifle from under a bed and fatally shot another four year-old who was also present. My sentiment mirrors the observation delivered by the quoted Detroit Police Department Spokesperson: The unfortunate incident was preventable and would have never occurred if the firearm's owner was more responsible. As a result of that irresponsibility the gun owner could face serious criminal charges. In the same video clip a neighbor, who happened upon the scene, also shared his opinion on camera. He also voiced the opinion that the incident was tragic, however, he went a significant step further in his analysis when he stated that he also owns a firearm but keeps it secured with a gun cable lock. It is a fundamental responsibility of gun owners to ensure that unauthorized users do not have access to their firearms. Obviously, four year old children fit that bill. A failure to be responsible occurred in the aforementioned incident. In general, any firearms which are "not in use" should be unloaded, separated from ammunition, and secured with a lock of some sort: trigger, cable, a safe, and etc. Firearms that are "not in use" are those guns that are not being actively being used for home defense, self-defense, or personal protection. Another issue that should also be addressed is the safeguarding of any guns that were carried in coats by adult guests that have been taken off upon entry or the safeguarding of any guns that are being carried in purses. In contrast, firearms that are actively being used should be loaded and ready for use, however, they should either be under the direct control and/or supervision of authorized users and simultaneously NOT be accessible to any unauthorized users. A firearm "actively in use" that is unloaded is as good as not having a firearm in the event of an emergency, such as a home-invasion. A home-owner can't call a time-out when predators barge uninvited into his home. If children reside in a home with a firearm or visit a home with firearms, the gun owners and/or persons watching and supervising the children should ensure that any guns in the home are not accessible to the children. This protocol is not necessary for every home, as every home doesn't have resident children or children visitors. One solution for "in use" firearms - specifically handguns - in a home with children present is to wear the gun in a holster. 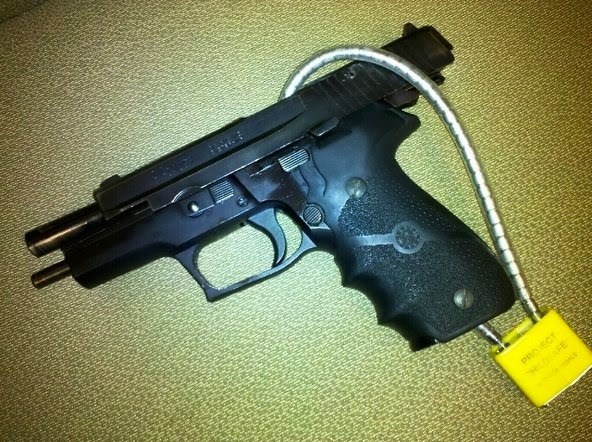 Another solution is to keep the firearm in a fast-open safe to keep it safeguarded while loaded until it is needed. Once children have acquired a certain level of maturity, parents can introduce "age specific" gun safety training and awareness to their children. In any case, access to an unsupervised firearm by a child at fours years of age should not be possible due to appropriate security measures by responsible firearm owners.